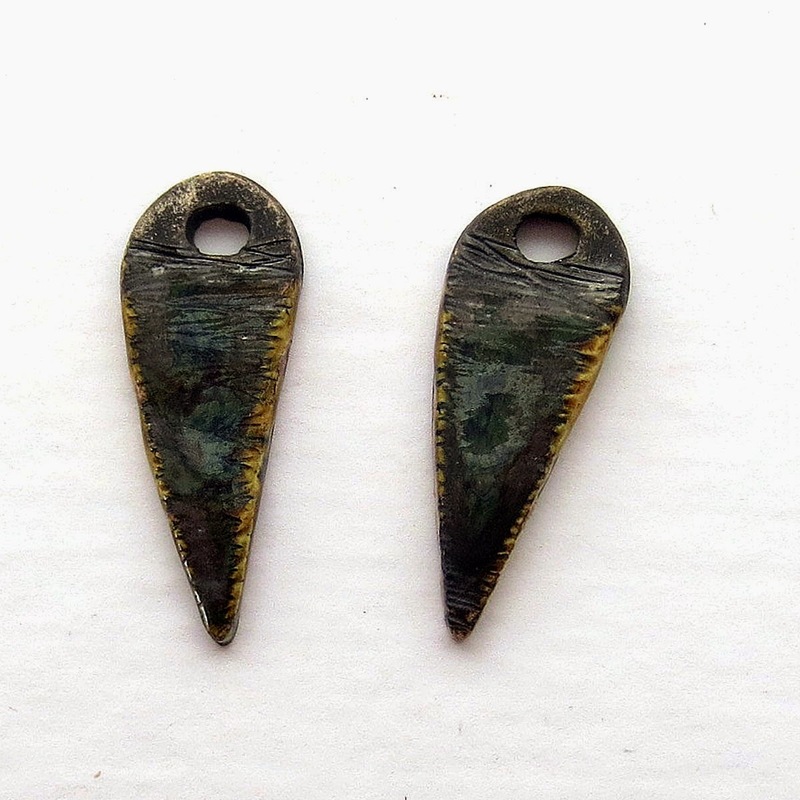 I was thrilled when I found these mini leather links in September. They are just 1 1/2 inches long and 5/8 inches wide. They have been waiting patiently for me to make something. And when I finally decided to feature them in this tutorial today, I checked back and found that they were out of stock. 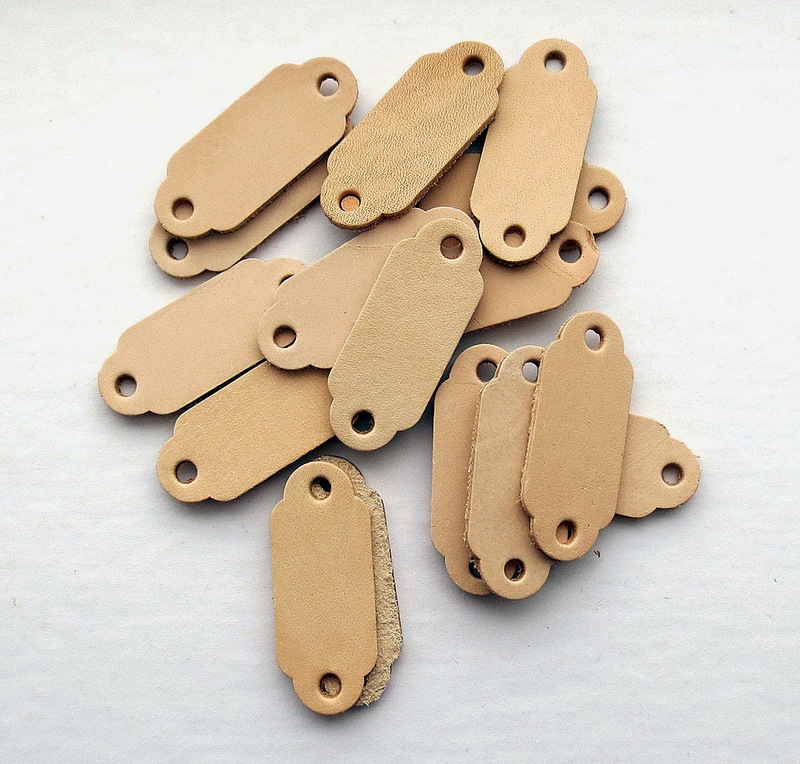 But, I contacted the website on the label, Realistic Leather Crafts and asked when they would be available again and within a day they were back in stock. You can purchase them here. Before I actually decided on a project for this tutorial today, I tried out some ideas on the links. I love how the leather accepts the stamping so well. 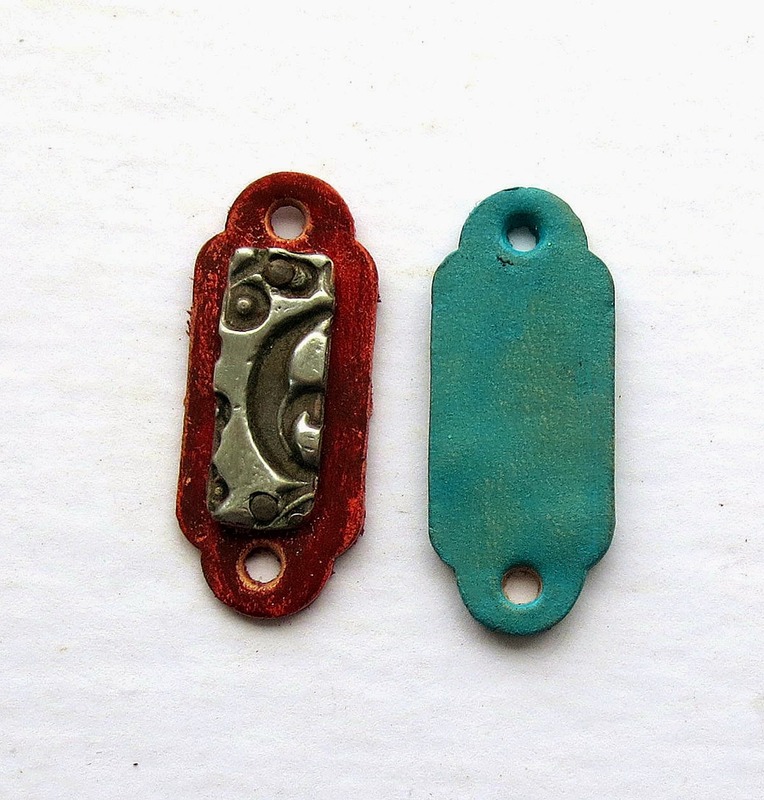 Here I tried out riveting a piece of stamped copper ( on the left) and coloring the leather with acrylic paint (right). These two techniques also came out well and have lots of possibilities. And then finally, I had a plan. 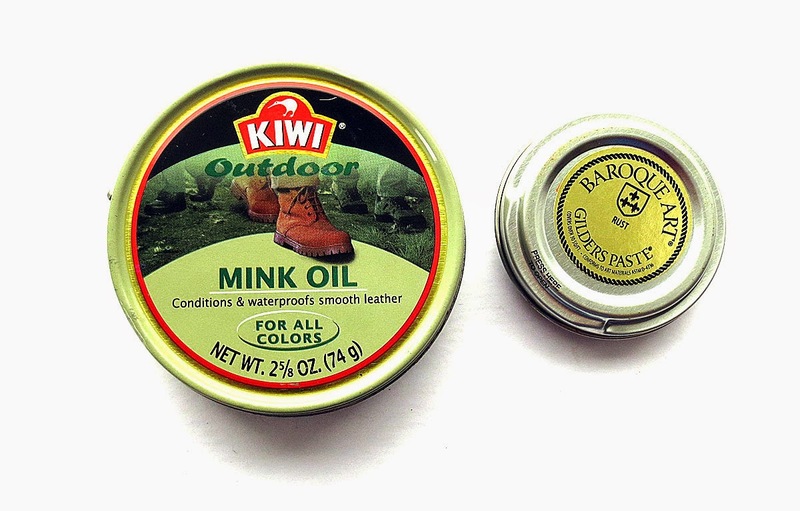 I used Mink Oil and Gilder's paste to color these two mini links and I was ready to go. 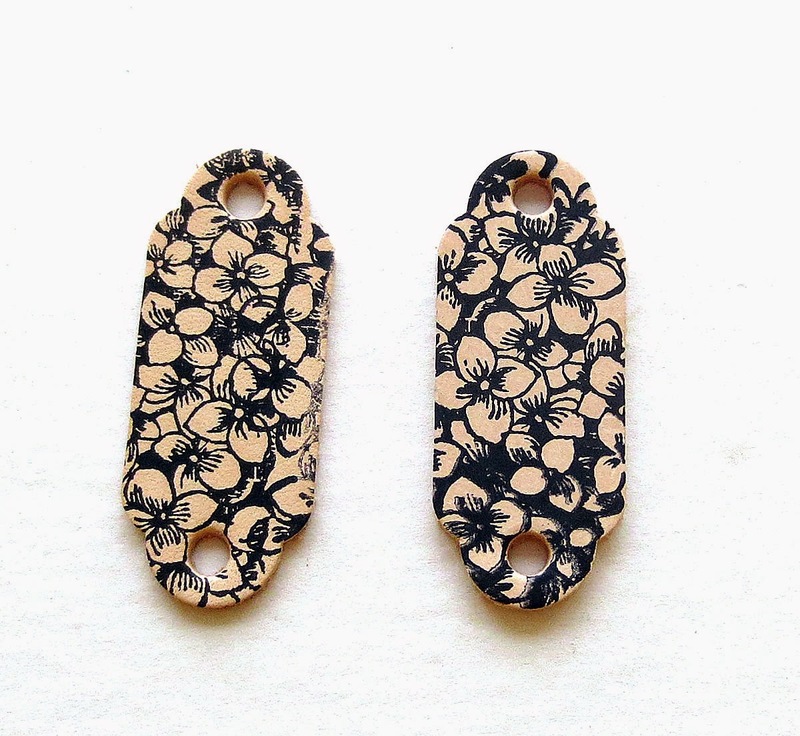 I had decided to make a pair of earrings with these wonderful ceramic drops from fellow ABS editor Claire Lockwood of Something To Do Beads. 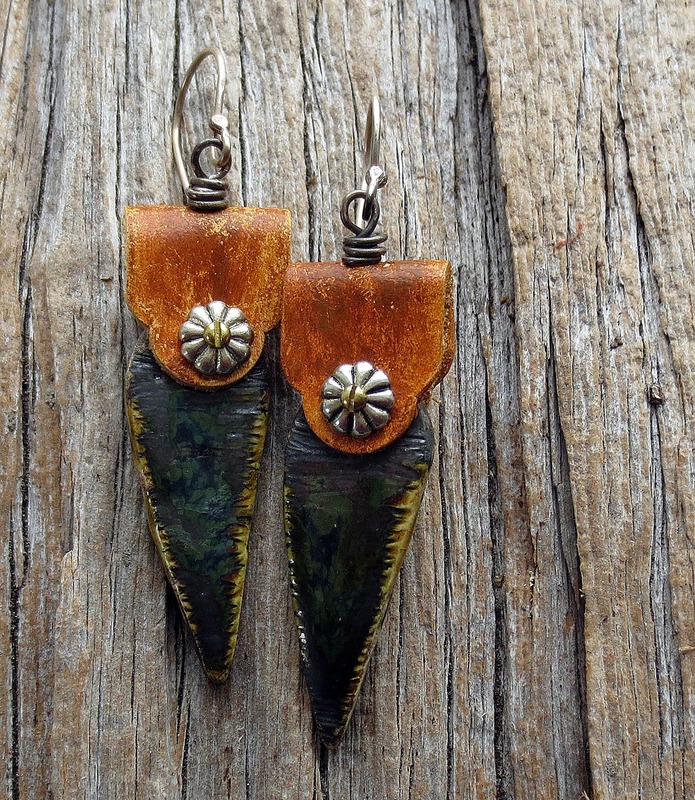 I love the rustic quality of these drops and the deep shiny black with the hint of honey brown on the edges. Here is what I made using the mini leather links and just a few other supplies. 1. 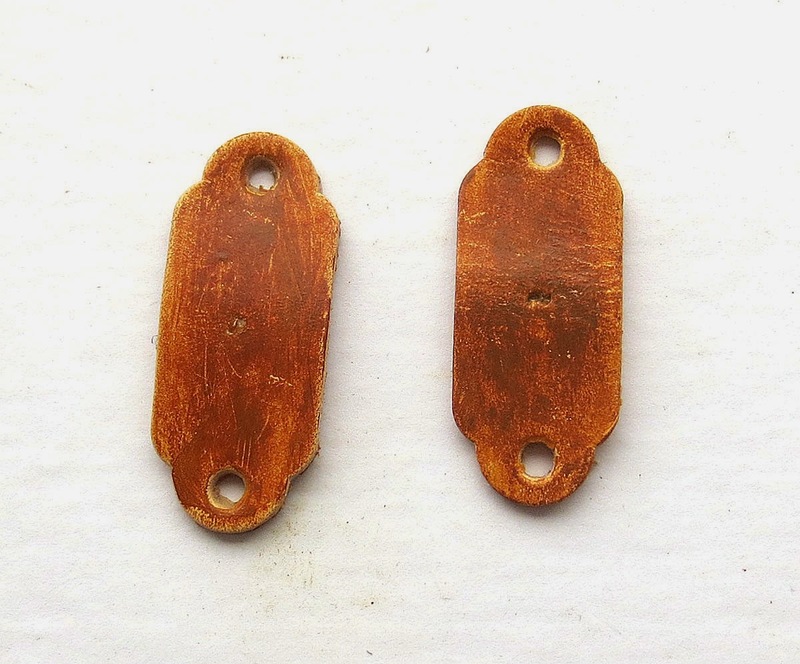 Punch a hole in the middle of each of one of the mini leather links: first soften the leather with a light coat of mink oil. Rub it in. Then fold the links in half, aligning the two holes. Press together to make a fold, then open and make a mark in the middle of the middle of the link which is 5/16 inch from the edge of the link. 3. 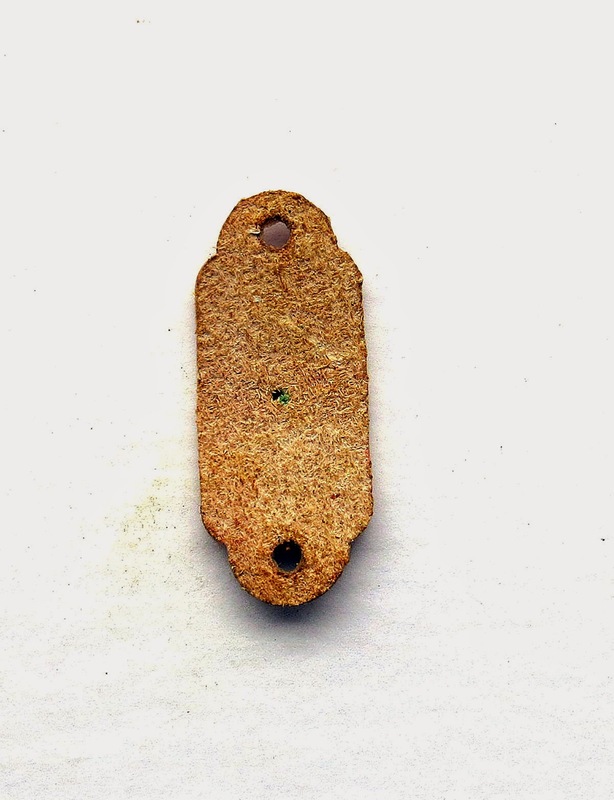 Apply rust color gilders paste to both links. Set aside to dry for at least 1 hour. Overnight would be better. 4. Now that the gilders paste is dry enough to handle we are going to put in the wrapped loops that will later be attached to the ear wires. 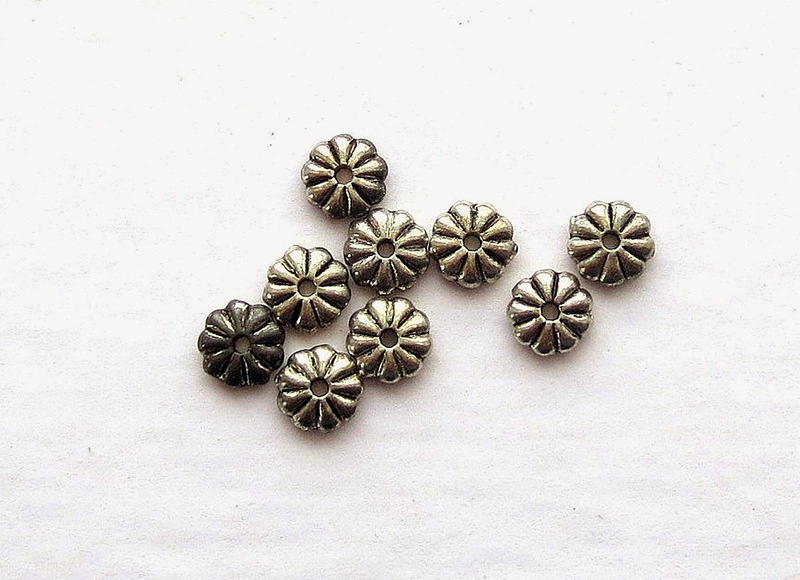 Insert the sterling silver balled head end pin into the hole we made earlier from the back to the front ( the front being the smooth rust colored surface) as seen in the picture below. Pull the wire through. The balled end will prevent it from coming through the hole we punched earlier. Make a wrapped loop as seen in the picture below. If making the wrapped loop scuffs up the rust color just reapply some more gilders paste. 5. Earring assembly. Add 1 heishi silver flower disk to each of the 2 long brass screws and move it down the screw until it touches the head of the screw. 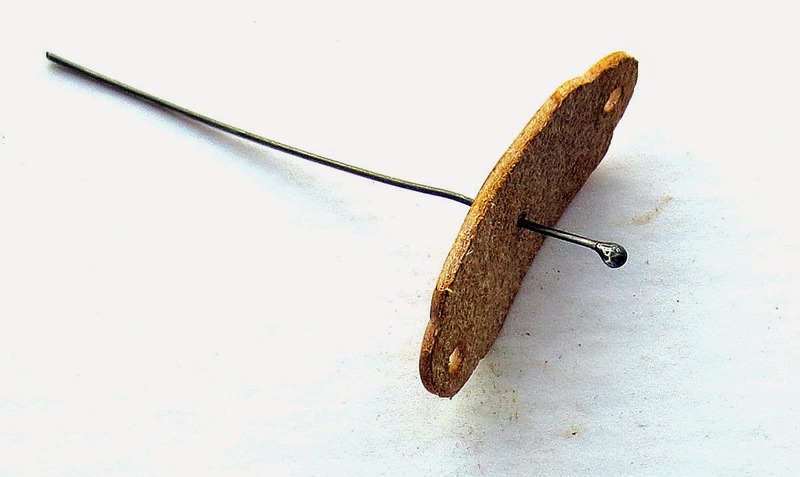 Now fold the mini link in half over the hole on the top of the the earring drop. Insert the long screw through the hole of the link the the drop. It should look like the picture below. 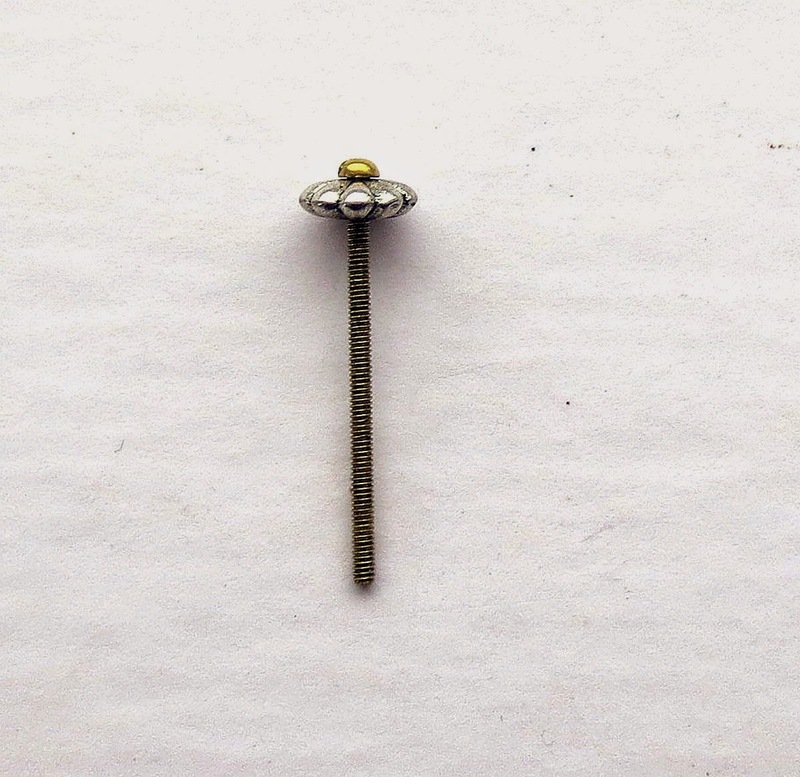 The front of the earring with the long screw going from front to back. 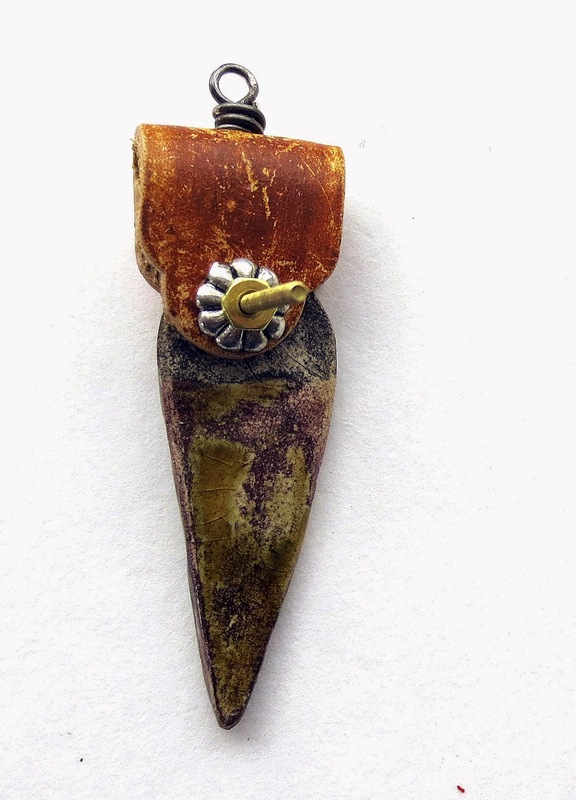 Then add the second heishi flower and screw down the nut to meet it. The back should look like the picture below. 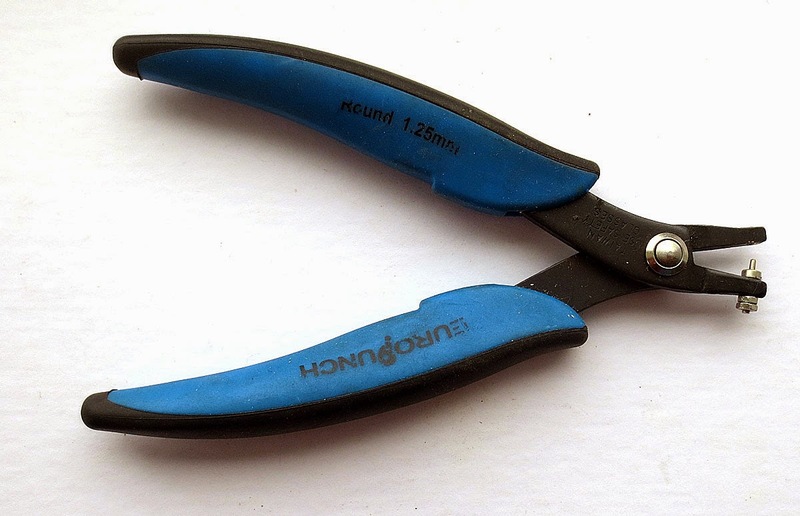 Tighten the screw by using your finger nail or a tiny screw driver to hold it in place. Try to have the center line of the screw go from top to bottom as seen in the picture . 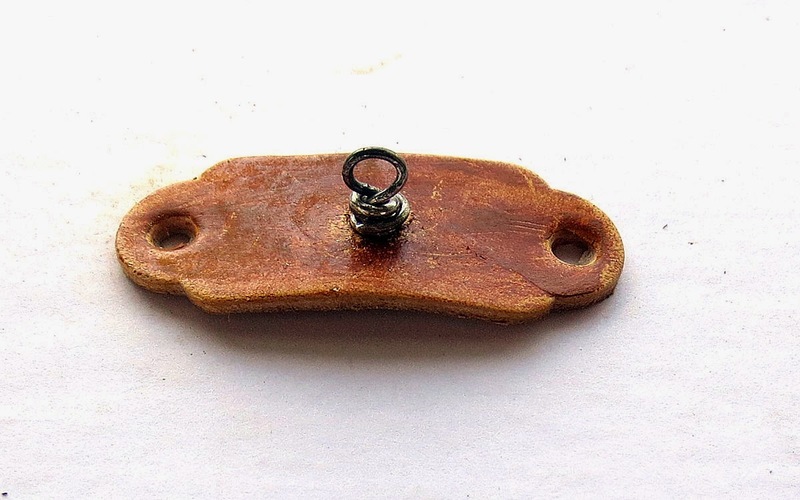 Use your flush cutters to clip off the extra length of the screw rivets, file smooth, and put a couple of drops of epoxy glue on the nut to keep it from coming undone. Now you can add your ear wires. Enjoy your new earrings. 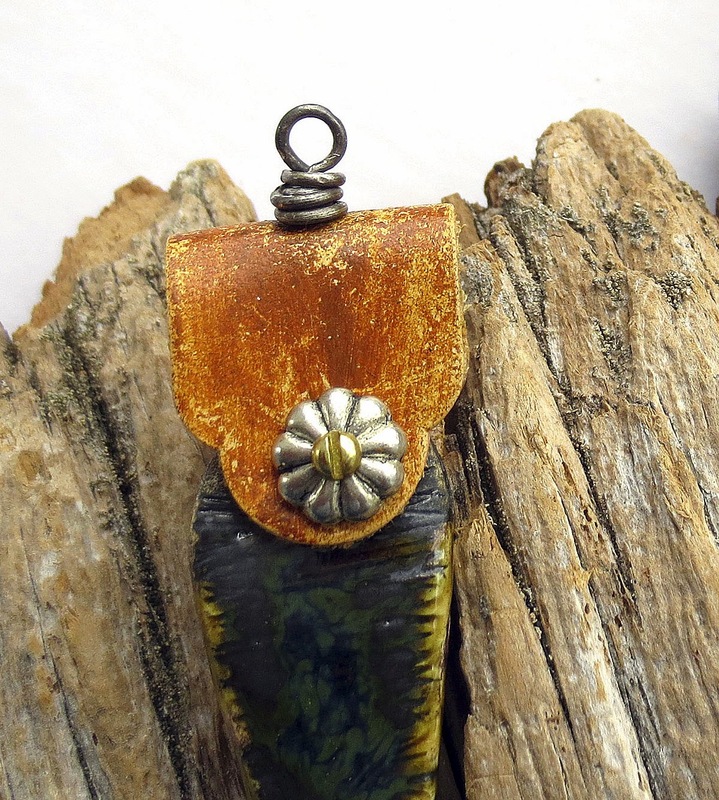 Great tutorial, I love how you used these leather links, thanks for sharing! Great tutorial. Thanks for sharing it. 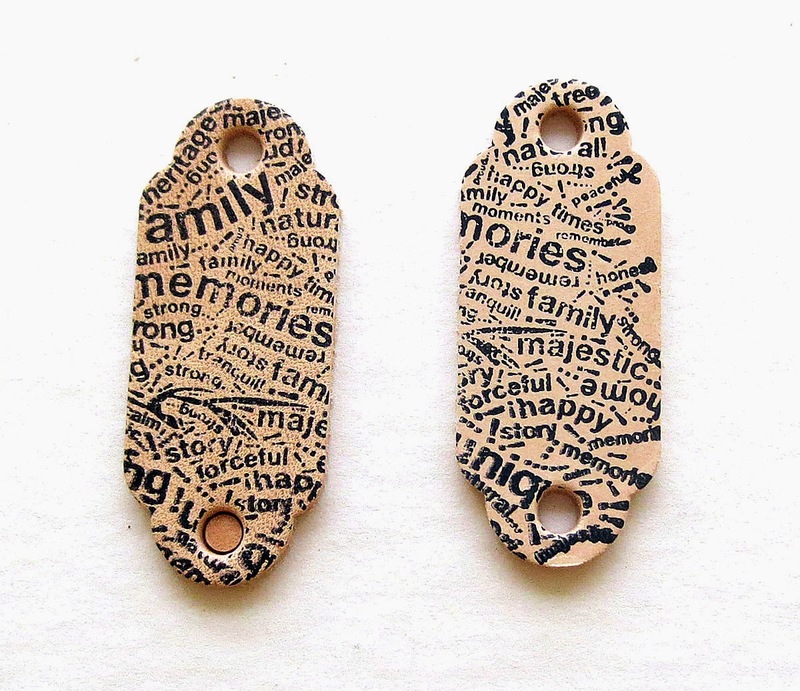 I love the stamped links too, great effect. I love these links and all the ways you've shown to use them. Your earrings are wonderful! This post is jam packed with fabulous ideas! My mind is in a whirl. Really love those riveted leather earrings, Claire.